Now that we're cruising again, we realize that it's much more fun to be on the move! Getting off the dock again after a lengthy pause is hard. You forget how awesome it feels to not know what your day will bring. The anticipation of what the next anchorage will be like and almost holding your breath as the sun sinks below the horizon and reveals it's secrets to only you... We didn't see many sunrises or sunsets back at the dock! I can't describe the feeling exactly... it's like opening the floodgates to my soul. We switch from one frame of mind to another... from that life to this life...one drop at a time. All of the memories of how we did things while cruising come flooding back... and we remember why we do this. 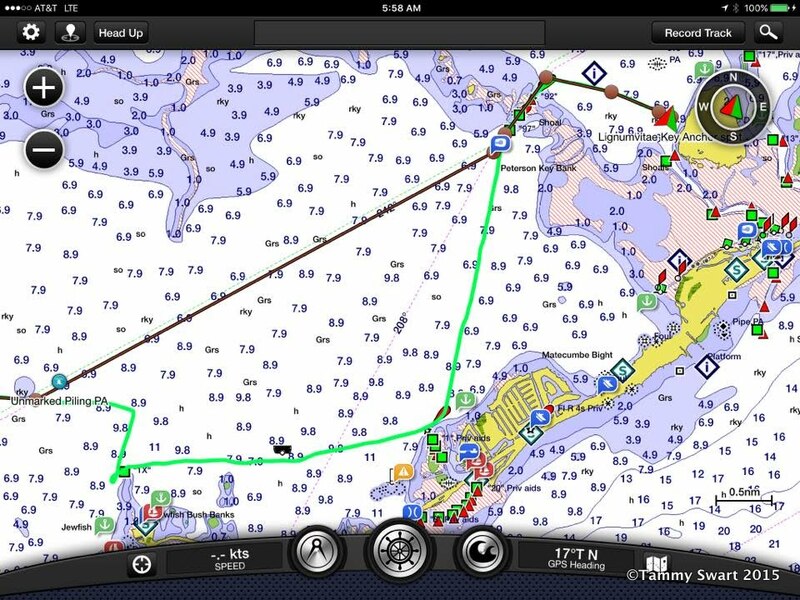 We left the Vinoy Mooring Field in St. Petersburg on the 17th of November. I can't believe we stayed there seventeen days! Where did they all go? St. Pete was kind of a stopover between our two worlds... A halfway house...Not quite "at the dock", but not quite cruising yet either. We provisioned, we hung out, we waited for the arrival of Sally and Jerry on Encore before continuing on. We started backtracking... back the way we had come in early summer. Back towards the islands. Very. Slowly. Next stop: Sarasota. We crossed Tampa Bay motoring towards the ICW entrance on the other side. Gusty winds did little to make these protected waters unpleasant. This time out we vowed to sail more, anchor out more, and motor less... but when we arrived in Sarasota after motoring all day, we checked out the possible anchorages there, and it just seemed stupid to forego the safety and comfort of the mooring ball... so we succumbed to temptation and were rewarded with a peaceful night's sleep before continuing on in the morning. It was there at Useppa that we caught up with another boat from Alabama, Mary and David aboard Liza. We had a lovely happy hour on their boat with lots of laughs as our worries dissolved away... drip.drip.drop...Now we're having fun! There is a stretch of more like 2 miles leading from Sanibel Island to Ft. Myer's Beach where several channels run. Only one has a bridge high enough for us to pass. These channels cross this straight and narrow passage and make for wicked crosscurrents... with lots of small boat traffic zipping and darting by, it can be quite unpleasant for sailboats. Today we were lucky and made it here near slack tide. The current was almost imperceptible except for one spot, and even then it was totally manageable. Suddenly we were past the Miserable Mile and looking at the bridge that signified the end of our day. The channel leading inside has been dredged. Much deeper than before. We motored into the familiar Ft. Myers Beach Mooring Field and took three balls in a row. We were delighted to find the field less populated than the other times we've visited... meaning we were given moorings in the West Field, which is MUCH closer to the dinghy dock. We arrived here on November 19th and paid for a week. Weather forecast said it would be at least that long before the winds would die down and come from a direction that would make it possible for us to continue on south in the Gulf of Mexico. There was a brief window of opportunity and Liza took it. They were on a short cruise and had more reason to get going that we did. We said goodbye to them and Encore moved up to their ball next to us. We spent our days provisioning, doing laundry... and buying a new Mac. Yes... I think I've killed our Macbook Air. It was inside my backpack and slid to the floor while I was doing laundry. Ever since then it has been acting very strangely. I REALLY didn't want to spend the money for a new computer right now... but with our impending departure from the US... I just could NOT be without a computer and it looks like it's going that way. I spend two days vacillating but in the end, an all day bus trip got us a new Macbook Pro. I'm still getting over it but it's better that it happened now than later... That's what I'm telling myself. Jezebel lays around and she didn't even EAT any turkey! 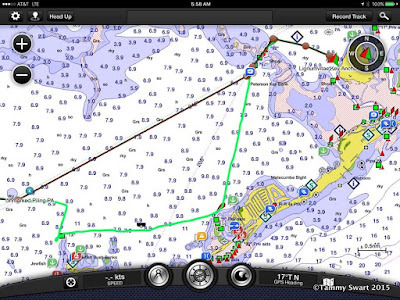 The day after Thanksgiving we moved from the mooring field to an anchorage just outside the entrance to the harbor. Bruce and I had used this anchorage coming north. It is an easy in/easy out and perfect for a pre-dawn departure. We arrived in the anchorage just before sunset after a frenzy of activity topping up water, fuel, and provisions. We were well protected from the NE winds. Holding is very good and the water was nearly flat. We spent a peaceful night and were up before dawn and ready to go. Bruce and I have cutters on our prop shaft, but even with those, we really don't want to test whether or not they work by motoring over one of the many MANY floating balls littering our path. So we waited for dawn. We left at first light. The winds were on our beam and the seas were perfect. Finally the weather gods had answered our wishes for perfect traveling conditions. Encore sailed the entire way to our next anchorage... Bruce and I motorsailed. We had a distance of almost 60 miles to make and we wanted to make good time. But even more, we wanted to make WATER! This was our first real chance to fill our tanks with our new water maker. We ran it for about seven hours and made over 100 gallons. I can not tell you how liberating it is to be able to fill our water tanks without stopping at a marina... And the trickle becomes a stream! 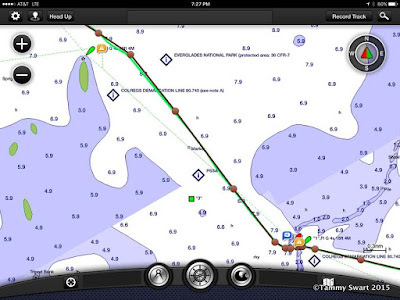 We rounded the Cape Romano Shoals, taking a chance and cutting through between the third and fourth shoal and thus cutting off about an hour of travel. Slowly we are shedding the fear which kept us on the magenta line for all of our first year and most of our second. We are learning to trust the charts and our own ability to make decisions for ourselves. We arrived at the Indian Key anchorage well before sunset and were settled by the time our friends arrived. This is a new stop for us. It is tucked up in the Ten Thousand Islands and is sort of out-of-the-way. We found it remote and beautiful and the feeling of being very far away caused the cruising stream to burgeon and allowed memories of being in the islands to seep back in. We watched the birds dive and float. We listened to fish splash. We felt the wind come down and take the waves with it, leaving us with a most peaceful stop for the night. Moving on, we were up early again the next morning. 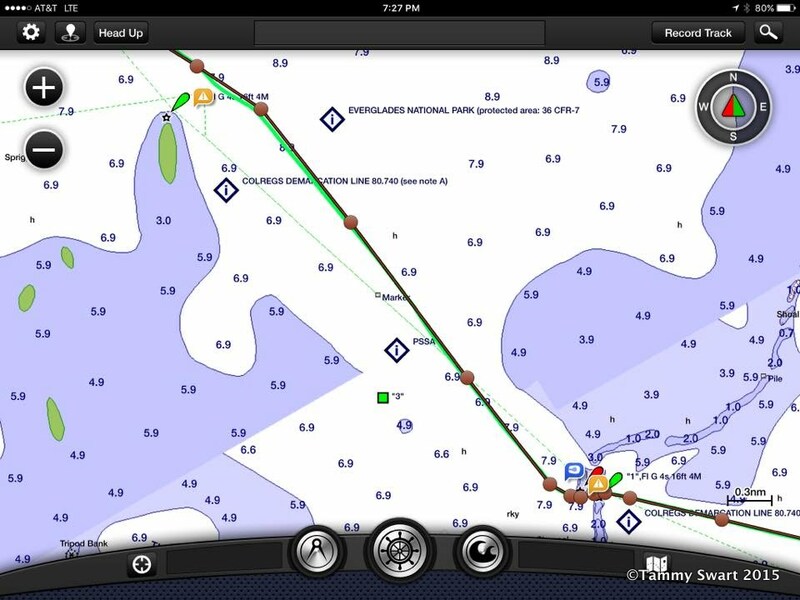 We didn't have quite as far to go, only about 45 miles... Next stop East Cape Sable. Today we sail! Conditions were just perfect. I started the engine while Bruce used the windlass to pull the anchor, but as soon as it was up I shut the engine down. We trimmed the main and rolled out the jib as I brought the boat to our course. I will tell you something about Bruce. He is a racer. Yes, he's gone cruisin'... but he will ALWAYS be a racer. The entire time we are sailing... he is checking trim and tweaking sails... He loves it. And he's pretty good at it. All day we sailed toward our next stop... Being in charge of the "plan" comes with a heavy responsibility for me. Encore turned it all over to us and were following our lead. I wanted to make sure I didn't lead them to anyplace unpleasant. The last time Bruce and I stopped at East Cape Sable, the weather didn't cooperate... we had an unforeseen light west wind which, along with the coastal current made for a bumpy night. Tonight we had a forecast of NNE which would (should) be fine... but I worry. It was the perfect day. The boat got up to over 8 knots on a surf with following seas... I describe it as a raucous sail on benign seas. A contradiction, I know, but that's how it was to be flying along like crazy with a kindly sea state. It was about as Happy-Making as it could get... and it was smiles all around. If I was FORCED to come up with a complaint... It would be the crab traps. These little balls are out there floating in astounding numbers. They aren't always that easy to see with the sun on the water... sometimes we were almost on top of one and had to divert to avoid running right over the top of it. Things began looking better as we rounded the last point and could see flat water. We dropped sail and motored up as close as we could get to the shore, counting on it to flatten the water just in case the wind didn't die down in the evening. I'm always very careful (after our experience in West Bay) to know what the tide is doing when we arrive to an anchorage. I estimate how much the water level should drop during our time in the anchorage and maybe add a few inches to what we would like to keep beneath our keel... and come up with our "magic number". I motor in as close as I can until the water begins to shallow to my "magic number" and then I do a wide circle, watching the depth so that I have a track on the Garmin that shows where we do not want to be. Then I pick our spot and Bruce drops anchor. By the time Encore arrived, I had done all of this and we were settling in for the evening. They anchored close enough to shout back and forth between boats... which bothered nobody, because there was nobody here but us! We were all too lazy to get our dinghies down from the davits so we sat in our cockpits and enjoyed nature's show. Wake the neighbors, it's time to GO! The winds did die overnight and we congratulated ourselves at finding the perfect anchorage once again. The winds were going to be on-the-nose, or close to it for most of the day, but we motorsailed the first part along the West Florida Coast before we turned more eastward. See that light spot, that's our path through the rain! Still dodging crab traps, we prepared for the squall. Amazingly, the rain seemed to part in the middle allowing us a pathway through it with only a few sprinkles. How lucky are we??? What I had failed to realize was that the hazard marker was just the BEGINNING of the shoaling and that it would continue through this entire stretch. I was afraid to even tell Bruce that the depth sounder was reading depths as shallow as 4'2"... a full SIX inches lower than it usually reads just seconds before we run aground... Somehow, we didn't run aground, nor did Encore. They snuggled right up to our stern and I kept thinking "I know why they're doing it... so that they can run in the furrow we're plowing". But there was no trail of sand kicked up behind us... And no bumping whatsoever. I just hoped that we DIDN'T come to an abrupt stop because Encore would be all up in our business! Crabbers were working the traps all over Florida Bay "Back Country"
With Encore trailing behind, I led us through untold millions of crab traps. You can't see them from afar, causing me to think we could anchor in this spot or that spot... until we got close enough to see that each anchorage was FILLED with crab traps. We motored through Bowlegys Cut and wove our way through still more crab traps... to the mooring balls. Oh look, another sailboat came... Oops! Thats US!! I had concerns that the winds might be too much from the north for this spot to be flat... those concerns were unrealized. Encore took one of the moorings and Bruce and I found a nearby spot to anchor in a broad, clear, crab trap free space about 500 ft. away. We wanted to be close because remember that fish Encore caught? Yep, Sally was cooking up fish tacos for us all tonight! We splashed the dinghy and enjoyed our evening with our friends. The next day would hold another new experience for Dos Libras. We have never sailed in Hawk Channel. All of our tracks between Marathon and Miami lead through the ICW inside... Another silly fear was put to rest for us this day. The weather was not perfect, the winds could have been a little more east for us to sail... so we motorsailed after passing beneath the Channel Five Bridge. The Cruising Floodgates came crashing down as we floated out onto the stunning waters, so like the Bahamas... How could we have forgotten this? Ever the optimists, we tried to sail... The waves were bigger out here causing an uncomfortable motion without sails up to steady the boat. We had to go off course to carry the sails, but with an adverse current thrown into the mix, we eventually admitted defeat and rolled the jib to continue on with main and engine. The winds were up and down, and we made slow time with the current against us... but it was beautiful out there and we had all day to get to an easy-in anchorage... Tavernier Key. This was another new stop for us. We could easily have made it to the more popular Rodriguez Key, but we needed to stop at Tavernier to pick up some water maker spares from Ryan, our water maker dealer. He just can't sit still... Wiping the windows... so I can see crab pots! This mostly worked and we got only a few sprinkles again... We continued on to our anchorage and rounded the shoal to find nice flat water once again. Bruce and I dropped the dinghy into the water and zoomed off to get our spares, then back to the boat for yet another peaceful night at anchor. One more day until we rest... Hold on folks... we're almost there! Up with the sun and off the hook at first light, we had another longish day ahead. Nearly 50 more miles to go and I was worried that we would have adverse current again making it slow-going. I was wrong! We had beautiful winds and we zoomed right along up the coast towards Miami! Lots of boats heading south! There was no getting around this one... A very tiny squall crept up behind us and rolled right over our heads. We saw it coming and doused sails just in time. But it wasn't long before we had sunshine again and it got very warm inside the enclosure... open it all up again. We made our final approach to this familiar Florida Channel icon with big following seas. We scooted up into the channel and the waters calmed significantly as we found our anchorage just outside of No Name Harbor. But somewhere along the way, these miles, this month... we were swept up again by our dream and we can't wait to see where this year (our third!!! And they said we wouldn't last) leads us. And HERE'S YOUR SUNSET! We're definitely in the "it feels nice to stop" stage of our year right now, especially since the PNW is being pummeled by storms and rain. But what I can really relate to is your aggravation with crab pots. I absolutely hate them. The ones laid by professionals aren't so bad but we have folks up here who think black makes a good colour for a marker buoy (no joke). Cheers and congratulations on the start of another season! I totally agree about the black crab pot markers... we see a few of those. I'm glad to be out of the land of crab pots for a while. Thanks! We're glad to be off and running again too!